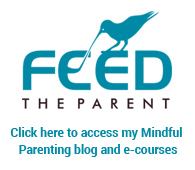 Over on my Mindful Parenting blog, Feed the Parent, I’ve been writing a lot about simplifying family life so as to reduce overwhelm for parents and cut stress for kids. But it occurred to me that EVERYONE could do with simplifying and slowing down life a little just to cope with the onslaught of digital information we get everyday and the pace of working life. So here’s my New Year’s guide to simplifying life so you can have much more head space, less stress and find it easier to be fully present with each day. 1. Meditate everyday, even a short time – of course, this is really the number 1 best way to declutter your mind! Start small with an easy daily goal like 10 minutes. Use an app or a guided meditation. Read my blog post about Making Meditation a Habit as a way to help you embed this in your life. 2. Declutter your home, or just a room – Do you feel cluttered in your house or bedroom or office? Having too many possessions clutters your mind with all their memories, meaning, and cleaning! Removing the chaos will help you feel freer. Give as much as you can to charity shops, sell it or recycle it. You will feel much better! 3. Make your home tranquil and green – loads of research shows that even just looking at nature reduces stress. Having plants in your home and a green garden outside will give you daily exposure to nature. Add potplants to your balcony, terrace or rooms, or if you’re lucky to have a garden, fill it with green and enjoy it! 4. Cut down 1 hour per day on watching TV and/or browsing the web or social media – Identify an hour of other activities to do instead at the times you would normally get on the TV, web or Facebook. This will give you an hour of time to allocate to something more nourishing like meditation, playing board games with your partner, calling a friend, playing an instrument, reading a book – schedule these instead. 6. Make every evening a Slow Evening – lots of research shows that screen use close to bedtime makes for poorer sleep. Make your evenings before bed all about relaxing and slowing down. In the hour before bed meditate, read a book, or cuddle your pet or partner. Here’s to a simple and clutter-free year!